Kaspersky Internet Security's main interface names and organizes security components in a slightly nonstandard way. 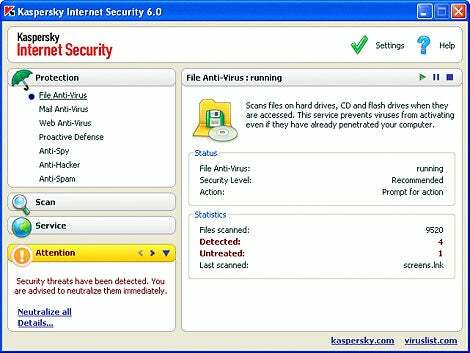 Kaspersky Internet Security 6.0--a suite of antivirus, antispyware, firewall, antispam, and Web protection tools--is top-shelf when it comes to detecting all kinds of malware. However, at $80 it is expensive, and its unique interface takes some getting used to. We looked at a prerelease build of the suite (a shipping version is now available); this prerelease version scored 100 percent in nearly all of our malware detection tests. These tests were conducted by German security research company AV-Test.org, with which PC World regularly partners for testing of security products. Kaspersky's suite caught all boot, file, macro, and script malware on a subset of the January 2006 WildList, a public list of widespread threats. It caught all of AV-Test's collection of bots, Trojan horses, and backdoors. (Detection of backdoors--undocumented methods of access--is a good indicator of success against spyware.) When deprived of signature updates from January 2006 and later, it caught 76 percent of these backdoors, bots, and Trojan horses, which suggests that the suite is very good at detecting undiscovered threats. To catch such threats, it also monitors your PC for suspicious activity. The suite detected nearly 100 percent of AV-Test's samples of adware--software that produces often-unwanted pop-up ads and that can track your Web surfing habits. (It missed 2 out of 713 files.) It also detected all malware samples within packed file archives (such as .zip). It looked within compressed program files such as ASPack and UPX and detected an excellent 83 percent of malware hidden inside--bad news for malware writers looking to bottle old worms in new packaging. The app was good--but not as good as some other products--at disinfecting ten worms already active on our test PC. The package cleaned up worm files but left remnants of Hosts file and Registry changes made by six worms. Also, Kaspersky's suite incorrectly flagged as malware 8 out of 20,000 clean files. This false positive rate--though low--suggests that you can't blindly trust its recommendation for action when you encounter a questionable file. Kaspersky's antivirus options are located here in the File Anti-Virus settings as well as in two other settings areas. During our timed tests, the suite proved relatively slow at performing the first system scan, but we found it should get faster with each subsequent scan, as it caches data from previous scans. However, it also caused a 15 percent slowdown in two of our WorldBench 5 application tests, so you may notice a drag on system performance. Kaspersky's firewall was solid, blocking all attacks from inside and outside our test PC. Oddly, the firewall settings aren't all in one place in the interface. Most options are in the Anti-Hacker Protection settings, but the ability to block specific ports resides in a separate area called Network settings. Rather than the standard antivirus, antispyware, and firewall naming conventions used by other security software products, Kaspersky uses its own detailed naming scheme. For example, it breaks down antivirus settings into File Anti-Virus, Mail Anti-Virus, and Web Anti-Virus; and, as mentioned above, firewall settings are labeled Anti-Hacker. This made it difficult to find certain standard settings such as the ability to exclude file types for scans. I had to click on the Trusted Zone button within the Protection settings and manually add an object-based rule. The Kaspersky suite's antivirus options can be customized. The application leaves out a few tools that come standard on competing products from vendors like Symantec and McAfee. For example, it doesn't have parental controls for prohibiting children from surfing certain genres of Web sites at certain times of day and privacy controls for preventing certain text-based data from leaving your PC. It also doesn't support individual instant-messaging clients, so it can't scan IM text or proprietary file-transfer protocols. It does, however, have important security features such as rootkit detection as well as protection against downloading dangerous scripts while Web surfing. For example, the suite prevented me from downloading a piece of software from a site strongly associated with adware. The latest version of Kaspersky's Internet Security suite is powerful, but its interface may not be for everyone. Plus, the $80 retail price ($70 as a download) is expensive compared with other suites, some of which have privacy and parental controls. But if PC security is one of your primary concerns, you can rest easy with this suite. This expensive suite is excellent at detecting all kinds of malware, but it lacks some extras found in other security suites.